Apart from stretching and exploring which bits of me creak the most, yoga is there to remind me to breathe consciously and slowly, and to relax. If the weather is not too wintry, it is exhilarating to walk over to the lawns with the faded morning sun and amazing views, to try a few gentle stretches. The dogs come with me to help and the puppies think it is fun to steal my trainers – it is magical to be outdoors. We tend to forget about breathing until, of course, it goes wrong, and often don’t remember that it is not just us humans but animals and even buildings which need to breathe as well. From school I vaguely remember that oxygen is about 21% of the air, nitrogen 78% with the balance made up of argon, carbon dioxide and a few man-made pollutants. Trees are vital to make oxygen and I’ve amused myself this week by doing the maths. Given the amount of oxygen each tree produces, and if you assume a tree is about 38ft high, I rely on seven or eight trees per year. Given everyone else who lives here, plus all our pets and livestock, it’s just as well that we have so many woods around the Park and Estate. Living here, I have also become aware, perhaps more surprisingly, of the need of buildings to breathe. The central hall of the Castle is called the Saloon from the French “Le Salon” rather than the “Wild West” John Wayne films’ version. It is constructed from something called ashlar masonry, which was later coated with a lime and sand mix, picked out into blocks to resemble stone. Then, some of the walls either used to be, or are now, painted. This material is soft and easy to damage so, for example, the Downton crew always had to make sure that any lights positioned over the gallery to light a scene below were very well padded. Nevertheless, over time, there are scratches and bare areas. One arch, which looked a bit sad, rather bothered both Diana, our housekeeper, and me. There are always things to be done but this really came to the forefront as it was there every time we looked up. Thus, when filming finished this autumn, I asked one of my estate office team, Mimi, to ring up some ashlar craftsmen. The two experts arrived and set up camp. The traditional mixture is most interesting as, of course, it breathes and moisture is not therefore trapped within the walls, which is what happens with cement and concrete. Lime mortar is more porous than cement mortars, and it “wicks” any dampness in the wall to the surface where it evaporates. Apparently this ability is widely referred to as “breathability”. 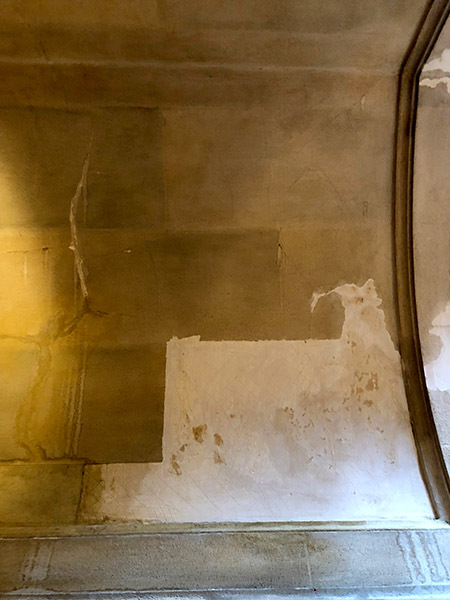 Cement can bear more compression but it is hard and brittle so it cannot move so, like the ancient Egyptians who also used lime and sand to plaster the pyramids at Giza, our restoration a typical mix of 1 part lime to 3 parts washed, well graded sharp sand. They did a marvellous job and I hope Diana is happy again. I reported back to my husband that they had finished perfectly on budget, in line with Mimi’s original quote. 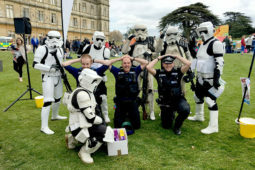 He was enormously surprised, not only because this is a staggeringly unusual event at Highclere, but because the whole business didn’t actually happen to be in any of his budget forecasts. I explained happily that this was because it had originally been organised under a need to know basis only but, because it had been such an excellent experience all round, I was now sharing the happy news with him! That sounds magical! Being in the open air is so invigorating. Yes, breathing is always a good thing. Sometimes we forget that inanimate objects also need to breathe. Sounds like breathing life into Highclere is a 24/7 endeavor. Lime is amazing stuff, our house was originally lime plastered, and room by room it is being reinstated and one can almost hear the house sigh with relief. Removing the concrete though, that is a sticky, dusty horrible mess. I hope you never have to experience that. Concrete dust travels for miles! Yes it does – you find it in pockets of coats for years after! What a beautiful and relaxing looking place to be outdoors exercising, especially with the dogs for company! It makes me want to go back and see the areas I missed when I was there three years ago. Thank you for sharing. The gardens change so much with the seasons, it is always good to come back at a different time of year. This is perfect on many levels! Yoga is indeed a gift – for breathing, for easing muscles, for appreciation, and for centering. My yoga teacher reminds us to breathe often during our various positions. Taking the mat outside is magical, and creates a connection that surpasses what is achieved indoors. And the dogs have a wonderful time as well! It is a beautiful connection. 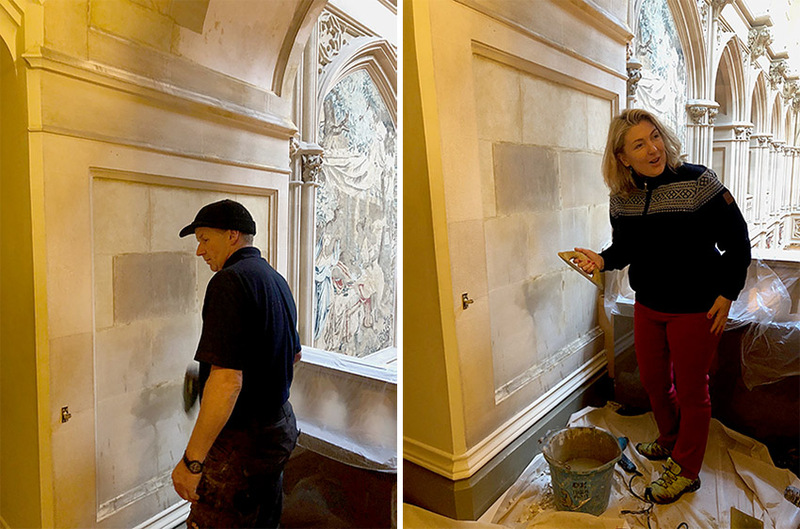 Congratulations on the budget-minded restoration project in the Saloon – “need to know” lists are a bit nerve wracking until the happy ending makes it right for a living, breathing structure. You wrote of walking ancient paths and breathing ancient air which still resonates with me. It is all connected! 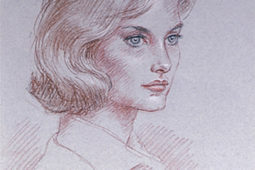 Thank you Charlotte, yes everything is connected and you really get a sense of that here at Highclere. Lovely article about rejuvenation and appreciation of ones’ surroundings. The pups certainly think we are silly when we strike those poses, don’t they? 😀 It would be fabulous to be surrounded by such beautiful gardens when doing so. I love the trees you showcase in your articles, and the information you have shared in the past about them. Have you ever heard of (or tried) goat Yoga? I have not tried it but have seen articles and funny videos about classes that are shared with our nimble-footed friends. I think I would mostly be laughing when I should be holding a pose. I hope you and your family and the Highclere crew have a wonderful week. Cheers from Summerville, South Carolina. I haven’t heard of goat yoga but it sounds like great fun! Yoga with the pups can be quite hilarious at times, especially when we are all going the Downward Facing Dog! How many Labradors do you have? We have five: Bella who is the grand-mama of the family, her two sons, Alfie and Scooby and now two of Bella’s grand pups Stella and Freya. It looks like an amazing area for yoga! It is so interesting to hear about the details of how to care for all things, ourselves , home and the earth. Lovely blog thank you. Lady Carnarvon, you’ve made me wonder: How do you allow for air exchange in such a large home? Is it mechanical or do you leave doors and windows open on different levels? Quite a feat for that much square footage. I can hardly wait for my visit on the morning of May 6th! Tickets have been purchased and I am having lovely dreams in anticipation! I hope to have the chance to meet you! The old doors and windows are naturally ‘leaky’ and so air circulation works very well – sometimes too well! If someone leaves a window open you can really feel the draft, particularly in the Saloon at the heart of the Castle. 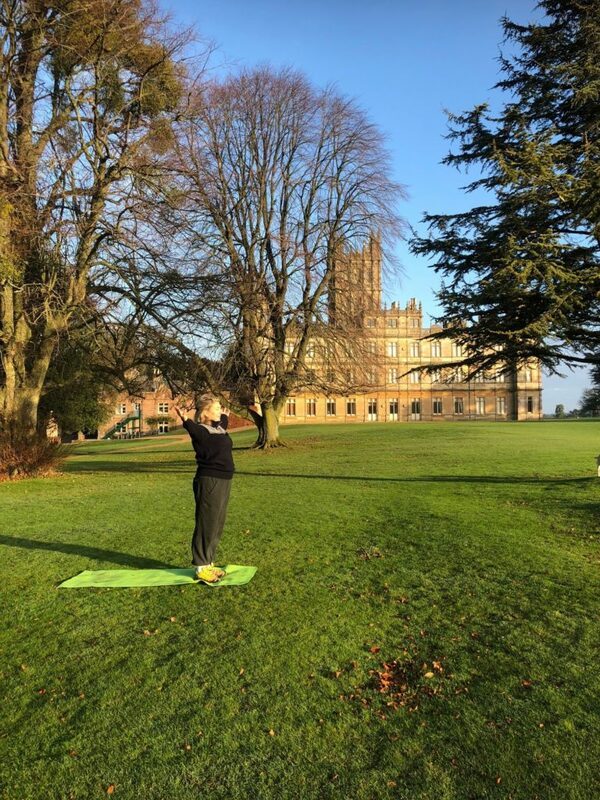 What a wonderful post on rejuvenating the body through yoga and Highclere renovations! With so many trees on the estate, you must feel completely refreshed when you breathe in that fresh air during a down dog pose. How many varieties are on the estate grounds? Almost too many to name! We have the statuesque Cedars of Lebanon along with medlars, pear and apple trees, yew, oak, beech, ash, common and silver lime trees. Then of course we have the Wood of Goodwill which is a newly-planted section which contains 38 native species of tree and a very special maple tree which was a gift from the people of Canada. And if it had gone wrong, he need never to know, right? 🙂 I love the photos especially the one where one of the dogs is helping you so much with your yoga – so sweet! 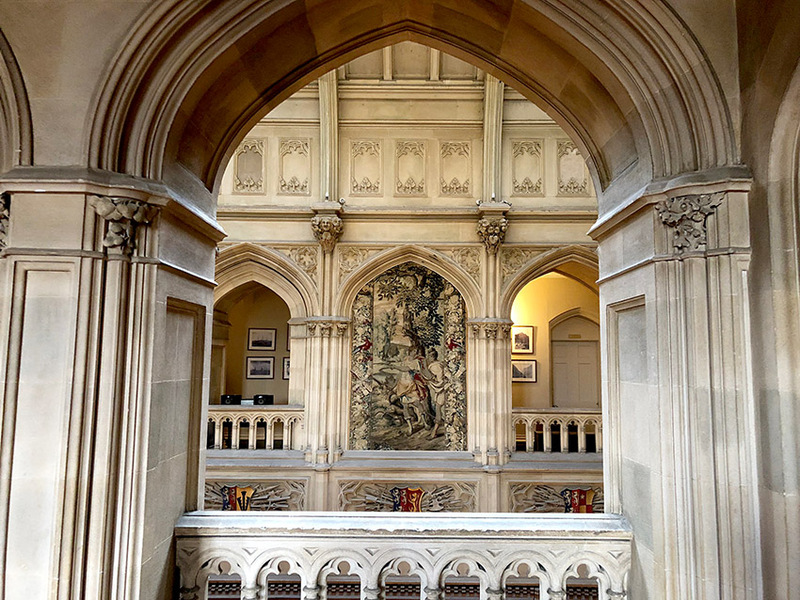 The top picture is looking into the Saloon, showing the repaired arch, if I’m correct – wow, what a beautiful view, and the landscapes in the other photos too. 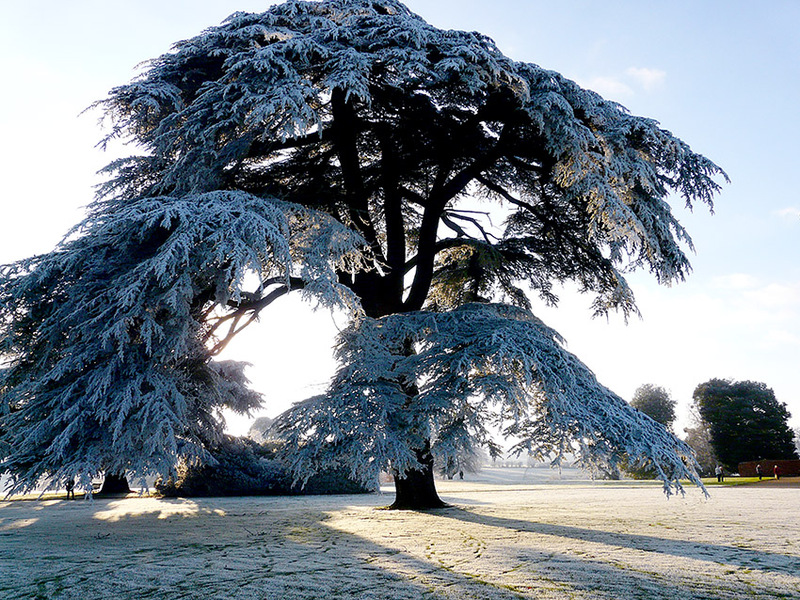 That Cedrus in winter is spectacular! Thank you, as always, for sharing. Glad to hear that the project finished on budget. Yoga does wonders for the body. I practice yoga 2-3 times a week, but I go to a yoga class because I’m not as motivated as you. When I skip class, my body is tight and my muscles feel heavy. 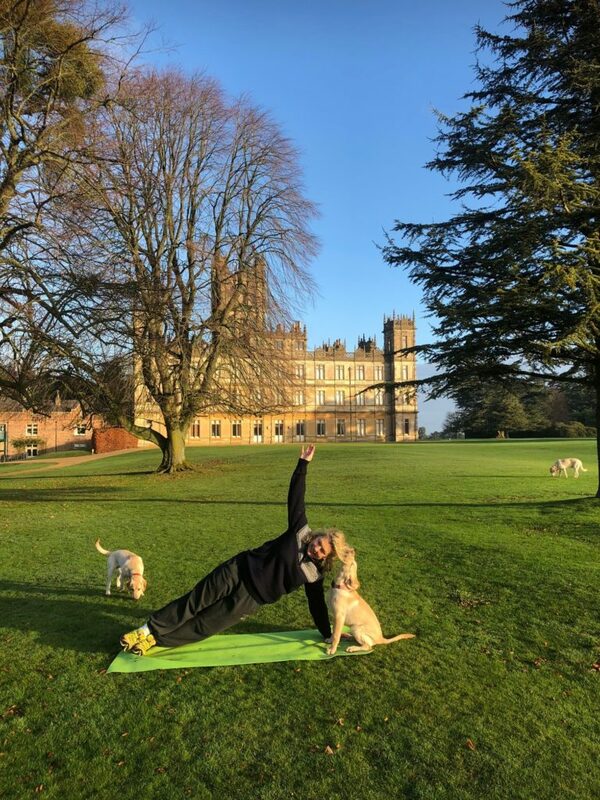 What an amazing experience to practice yoga in a setting like Highclere with the puppies! I certainly feel much better when I practice yoga regularly; with the British winter weather we have to seize the good days when we can and get outdoors. I’ve just recently signed up to your blog and am fascinated by your comments and past blogs. I look forward to reading them in future. I have visited the castle a few years ago, maybe one day I’ll visit again. We’d love to welcome you back to Highclere. Lovely post as always & a great reminder for fresh air to blow away the cobwebs within our bodies, homes & souls! You are such a “word weaver” when talking about your husband. The long way around words show that you love him, think he is funny and cute, and is a never ending source of amusement to you. This is magic……so integral to living a lifetime together. Enjoyed your post. We have a housekeeper at my job, Melissa, and she takes care of EVERYTHING! This would have aggravated her to death until it was fixed. It sounds as if your Diana has the same tendencies, lol. Thank you so much for sharing. Thank you for another very well written blog! You painted a picture so clearly that I could almost smell the clean air by the massive cedars on the estate. I took two pictures while I stood under its branches and looked up to the sky. They are among my favorite photos from our trip. When I look at those photos, I am reminded of a wonderful experience in a wonderful place. and how small we really are. I laughed when you said the dust from cement finds it’s way even into pockets! It is so true. I have cleaned the cupboards again and again, but I still find traces of white dust hiding behind the odd cup or glass. It seems to repeatedly float in whenever a door is opened even after I have whisked it away not an hour before! (big sigh)Renovation is not for the faint hearted! How I would love to be in attendance for the Christmas season at Highclere. I enjoy our warm weather here in Florida, but when I look at pictures of the frosty trees on the Castle grounds, and the photos of past events there, I long to be back in England and again enjoy all it offers to a much-too-busy American. It forces us to take time for Afternoon Tea, walks, and just to take in the country air. Come for Christmas next year! I have also taken some photos looking up at the spread of these trees but never quite find I can reflect them! Thank you for a reminder that we all share experiences of everyday life. I miss my Doberman who accompanied me to yoga class every week. She had her own mat because she was as long as I am tall. She actually did her version of the poses, esp. “downward dog” and her timekeeping sense of the routine was impeccable. At the end when we were relaxed with palms upward, she’d be on her back and wiggling while making Dobie noises of delight. Is there such a thing as “Giggling Yoga”? I have a memory of trees planted along a long drive to a ranchhouse in West Texas. The story is that a father planted them in memory of his son who had died in Vietnam. It has been awhile since I’ve traveled along Interstate 10 in that area. I don’t know if it’s still there. If I remember correctly, the trees planted along your drive were planted as a memorial. Bringing a living memorial to the world is a sign of hope for the future even if each tree is watered with tears in the beginning. That’s what we do as humans; we mourn our losses and hope for the future. Healing begins when we express our hope as action. And, thanks for the information about “breathability” of a house- in the USA everyone wants a “sealed” house and we have trouble with various types of mold, mildew, etc. Since Hurricane Harvey, people who didn’t lose their houses have had to deal with that, too. As I said in the beginning I appreciate your sharing the common challenges we all face. Good luck with the next project and I think it’s great you came in on-budget. That truly impressed me. Being on budget is rare!!! After reading your beautiful and inspirational blog post, I think I will go outside and have a walk in the sunshine and breathe in the fresh air. Love the photo of the doggy on the mat as you stretched and the word picture of the puppies stealing your trainers–I am smiling!!! Happy that this impromptu much needed “renno” went well, did not cost an arm and a leg and most importantly did not send hubby off talking to himself!!! PS: I did find a book about George Canning. I can’t wait to read it. Thank you for sharing that pic of the Cedrus Libani that tree is a presence! I loved your blog on yoga with the dogs, I was at the castle this past July and enjoyed the beautiful grounds first hand. I plan to return in 2019 and look forward to seeing the glorious renovations! God bless and Merry Christmas! Under budget is the best feeling! You also looked like you were enjoying the process of doing the job. I do enjoy your weekly blog. I congratulate you for doing yoga. I believe in it myself. It gives peace of mind and clears the lungs. 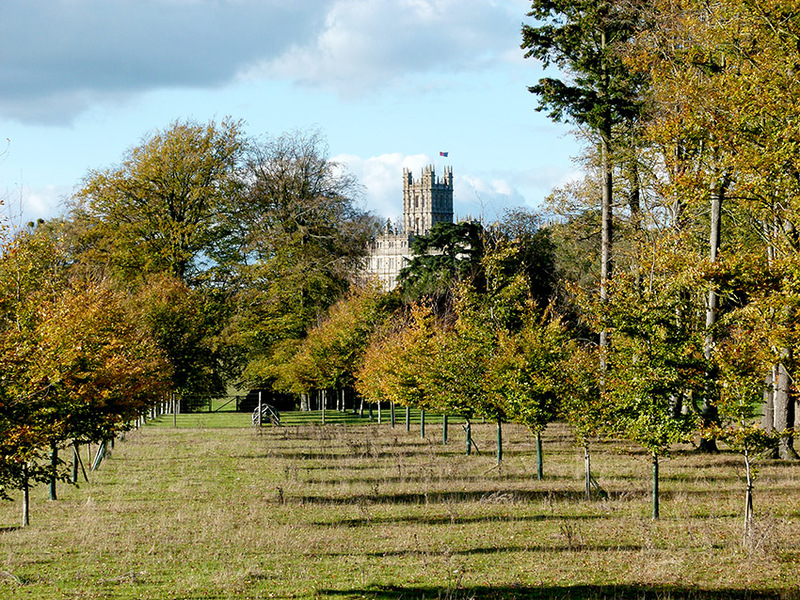 It is a beautiful picture with Highclere and the golden yellow trees. It so true, we all need to breathe; including the buildings and space. HAPPY HOLIDAYS to you and all at Highclere!!. In this day and time, it is so refreshing for someone in the public eye to enjoy life and living!!! Thank you for sharing a little insight to the world at Highclere!!! SALLON OF HIGHCLERE CASTLE. THANK FOR EVERYTHING. I am not really sure – high !! Thank you for sharing that you do Yoga. I started two years ago, partly because I am no longer young and thought it would help my stamina for competative riding, but also because I found I could no longer get up off the floor without holding onto something. I am not sure if it has helped the riding, but I can now get up off the floor with ease, and classes which used to seem hard, now just seem normal. Everything still creaks, and sometimes hurts, but I think that is more a function of not being young and something I am willing to live with given the results. I live in an interfaith household, so I wish you and yours both Happy Holidays and Merry Christmas. Thank you – and you are right it does get easier and I stay creaky!! I love your blogs for many reasons: pictures are always enjoyed, projects as I love that behind the scene peek and I always learn something from you or a posted comment. Today, I learned about a restoration technique and that I need to add yoga to my life; hopefully, to once again get up off the floor, unaided, when I join my grandson toddlers in their play. It is a diverse life! Your truly an amazing women and just too funny! Your close friends are so blessed to know you personally. I bet you laugh so much! You have such a blessed life and I am so happy that both you and your husband are so magically in tune with Highclere. As insane as it may sound, houses have personalities. Sometimes it seems like we serve our houses vs them serving us. I actually just finished watching Downton Abbey and I imagine it must be fun but very hard to have so many people in and out of your home. I think you should have your own television show featuring you and your husband renovating your home and gardens. You could have your own TV show similar to This Old House in the US. So many people would love to follow the progress of the castle because we too have grown attached to the estate. Due to Downton Abbey. It would be a number one hit. I promise. 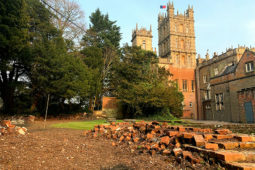 What sponsor wouldn’t love to be associated with Highclere Castle. Now my mind is running wild with all the possibilities. I hope you think about it. You could be the newer Martha Stewart and even start your own line of just about anything. This extra money could help with the budget. I know all about balancing that Reno budget. I truly believe that so many people feel an attachment to the estate and would love the opportunity to see it restored little by little. Both you and your husband are so down to earth and enjoyable to watch together. Your love for one another and Highclere is so apparent. It brings happiness to people. Everyone doesn’t have an estate the size of Highclere however, everyone’s home is their little estate. Thank you so much for sharing your home and all your renovations with us. You are very inspiring and extremely informative. I can only imagine the immense pressure and tremendous responsibilities that you both carry in your heart, as guardians, of Highclere. In my heart, I wish you didn’t have to open the house to the public. However, life is very different now and the cost of products and labor make it a precarious situation for any homeowner. How amazing are you and your husband to tell people that you the guardians of Highclere and it is costly even to you. It makes it all relatable and reassuring that you are in the same situation as we all are in this day and age. Of course, your home is on a much grander scale. To be honest, I really can’t believe I am writing this email to you. I have never written to anyone before in this manner. However, after watching the television series and an interview with both you and your husband, I have to say, I am officially a fan of someone. Lol! I am rambling away with my morning coffee, assuming you will not see this email. I am just thinking aloud with my imagination running wild. But it’s time to wrap it up and get back to reality, and my gingerbread house, I am currently giving a little remodeling to in areas. How appropriate! Lady Carnarvon, you are truly “a Lady!” I wish you all the best this coming year. Peace, health and happiness! You could be the next biggest thing to happen to TV. It would be very exciting for us to see you in action remodeling and rebuilding parts of Highclere. We all feel an attachment to Highclere from a Downton Abbey perspective however, a TV show allowing us to take part in the care of Highclere would be amazing with you at the helm. You are very kind – we do rely on the English sense of humour. What is lovely is people come here to work for a few days, a few weeks or even 2 or 3 years and just stay. My father in law opened Highclere to the public in 1987 – it is now open for more days in many more ways. These houses are meant to be shared and like other great Stately Homes we are finding our way forwards in today’s world. We try different ideas, paths but wherever I go, I go with my heart. My partner and I visited your lovely home today to see both Highclere and the Christmas market which was great fun. We both like visiting historical properties and homes for the history, architecture and beauty, though I have to say, of all the stately homes we have visited, your home is the most homely and welcoming. It’s history sits in harmony with the house rather than having the feeling of a vast mausoleum which happens to house a family as a lot of others do even though they are beautiful. I look forward to coming and seeing Highclere in the warmer months and the house in sunshine. You are very kind- thank you for your comments! I think we are looking forward to the sunshine too!!! Such a lovely setting for a bit of yoga! I really must try to get back to going to classes, since I remember so little of it, but always feel better when I do it. I have to laugh and share a funny story about doing downward dogs. My own beloved pup, a silver Standard Poodle named Sprite (who is, alas, not nearly as spritely now at 10 as he once was) always gets between my legs and arms when I do one of those, and rolls over on his back, looking up at me with a very silly grin on his face. I have some very funny pictures of him doing “upward-facing dog” poses in response to my downward ones. I’m glad your ashlar restoration went so well, too! Thank you – yoga with dogs is always such fun. What a lovely post – and quite helpful, too. Perhaps some focused breathing or yoga might calm me down a bit. I just purchased a ticket for the Art & Architecture event on May 12, 2019. That squealing sound you may have heard is me – beyond excited for what I expect will be the single most spectacular Mother’s Day I have ever had. Highclere is about 4,000 miles and many flights away from my home in the midwest US – but I just know that every mile of the journey will be worth it. I am so very thrilled to be visiting your beautiful home. Counting the days! It will be a fun day and I am sharing the talks with James Stourton on the 12th May. He began at Sotheby’s in the Old Master paintings department, became Chairman, has written various books about collecting and knows our paintings well! Hello – Can you tell me how to find out tour dates for Sept – Dec 2019 please? We are trying to figure them out – we are going to create some tours around the film to highlight being behind the scenes and then move towards Christmas because that is my next book and I am giving some thought as to what might be most enjoyed. We are trying to confirm other events in order to weave it all around and hope that by Easter we will be there.